A government investigation "raises the risk of civil penalties on data privacy violations, and if history serves, could take multiple years to resolve," analyst Justin Post writes. Post reduced his 12-month price target on the social media giant to $210 from $230, a target he issued on Thursday. For the second time in five days, Bank of America Merrill Lynch reduced its price forecast on Facebook shares as the fallout from the data scandal worsens. The bank slashed its original forecast on Thursday. On Monday, the Federal Trade Commission confirmed it has an open nonpublic investigation into Facebook's data privacy practices, a development analyst Justin Post called "significant." "It raises the risk of civil penalties on data privacy violations, and if history serves, could take multiple years to resolve," Post told clients in a note Tuesday. "We believe the key questions at hand are: was Facebook transparent in data usage; and did Facebook properly notify users of policy violations." In its biggest crisis ever, Facebook is under fire over its handling of personal data following reports that political research firm Cambridge Analytica wrongly gained access to personal data of more than 50 million Facebook users. 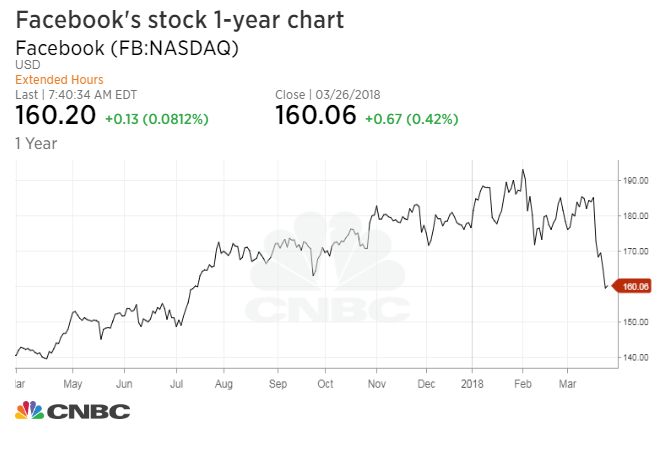 Post, who still has a buy rating on Facebook, reduced his 12-month price target on the social media giant to $210 from $230, implying more than 31 percent upside. Before Post cut his target last week, his forecast had been $265. Facebook shares fell 4.9 percent Tuesday following the analyst's call. The shares are down 9.4 percent in one week and 16.1 percent this month. The analyst also addressed recent reports that Facebook tracked users' calls and text messages, noting that the feature was both opt-in and easy to turn off. "While we do not see much direct risk tied to the call logging, the incremental headline pressure will not help with user sentiment," Post said. "The #deletefacebook campaign persists, though Google Trends suggest fervor peaked on March 23, and it remains unclear as to how many users actually are walking away. We see the second quarter of 2018 as the first real test of user trends."